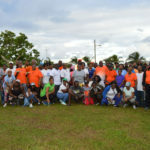 BASSETERRE, ST. KITTS, November 7, 2017 (PLP PR Media Inc.) — While it was the first time the rebranded Peoples Labour Party/Prime Minister’s Monthly Health Walk took place in Constituency Number Six, the turnout was so impressive Prime Minister Dr the Hon Timothy Harris took time to commend its organisers. 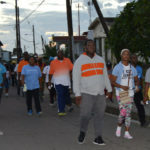 Health conscious walk enthusiasts, who every last or first Saturday of the month join Prime Minister Harris, as he fights the scourge of NCDs among the public through practical ways, had defied the early morning darkness and by 5:00 am had assembled at the bus stop in Saddlers, ready to take off towards St. Paul’s. Dr Harris is also the National Political Leader of the PLP. 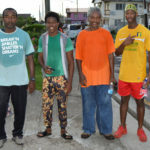 The walk had been organised by Mr Kevin ‘Ninky’ Williams, the PLP Branch Chairman of Constituency Number Six, who walked right behind the Prime Minister all the way. He later ensured that there was more than enough food in the form of a healthy breakfast for the walkers who had turned up from all the corners of the island. After a word of prayer said by the Peoples Labour Party Women’s Arm Representative and PLP’s Prayer Warrior Mrs Sonia Henry, the energised walkers that also included the PLP’s Deputy Political Leader Senator the Hon Akilah Byron-Nisbett walked towards Lavington in near semi-darkness as it was not until when they got to Parsons that good light came out. Leading most of the way was regular walker Rastaman Mr Clifford Davies. However by the time they got to the finish point, Rastaman had been beaten to the third place. Getting to the National Bank ATM in St. Paul’s in first position was Mr Vibert Whattley followed by Mr Milano Welcome. In the fourth place was Mr Damien John. Peoples Labour Party officials also came out to support their National Political Leader. They included the National Secretary Ms Myrtilla Williams, National Party Organiser Mr Alexis Nisbett, Youth Arm Representative Mr Manasses Huggins, and Assistant National Secretary Mr Christophe Greaux. Others were executive branch chairmen, Mr Cante Bowry (#1), Mr Nubian Greaux (#2), Mr Philmore Bedford (#4), Mr Glenville Mills (#5), and Mr Lenworth Harris (#7). Also present was a PLP Founder Member Mr William Phillip, and branch officials Ms Marsha Lewis (#5), Ms Pretrona Thomas (#4), and Mrs Gloria Fraser (#4). 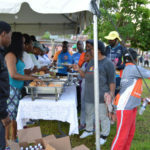 He singled out for special mention and congratulated Mr Kevin ‘Ninky’ Williams for having mobilised so many people to come out and take part in the walk and also for ensuring that at the end of the walk they all had a healthy breakfast. 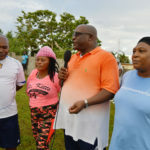 Others that were recognised and thanked by the Prime Minister included Mrs Gloria Fraser of Constituency Number Four who has not only been taking part in the walks but also bringing others with her, and all the others from Number Four. Mr Glenville Mills and Ms Marsha Lewis who were present and took part in the walk were also thanked for making arrangements for a church service that was going to be held the following day in Sandy Point. 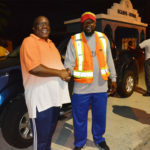 Chairman of the PLP Branch Constituency Number Six, Mr Kevin ‘Ninky’ Williams, thanked all those who turned out for the health walk in his constituency adding that it was quite encouraging to see such numbers.